Sunday, July 30th wasn’t the average race day for Westbrook’s John Peters, driver of the #51 Runtal Radiators Pro Stock car. 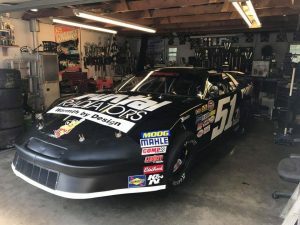 The John Peters Motorsports team loaded up their car and headed to Wiscasset Speedway for the Boss Hogg 150, an 150-lap Pro Stock race at the 3/8 mile oval located 1 hour North of Beech Ridge Motor Speedway, Peters’ usual stomping grounds on the weekend. Being a past victor at Wiscasset, Peters was excited to make another appearance at the racetrack. By the end of the day, excitement turned into frustration for Peters and the entire #51 team as the day took a highly unexpected turn for the worse. It wasn’t long into the race before the #51 team suffered from a twisted form of fate. From his point of view, John says that he was having a good race, making his way up to third early and trying to track down the leaders. He calls what happened next “a racing deal”, recounting the events that took place. “I came out of turn 2, which is a full throttle spot at Wiscasset. The second place car had just spun going into turn 3. It looked like I had room to avoid him high, so I backed off and committed to the top. Not a split second later, his car rolled up the track, so I hit the brakes and cut the wheels left. I got the car pointed towards the bottom but it started to slide and I just couldn’t get low enough. My right side door caught his left front, which ripped everything out of the right rear, spun me around and launched me into the wall. It happened really fast,” he recounts. Peters’ said that he immediately knew the wreck was major, saying that he saw his rear end tube, wheel, tire and brakes go flying down the track. John’s Dad Greg Peters also knew that it was a vicious wreck, saying, “Our first thoughts were “Is he okay?”. He told us on the radio that he was okay, so then the frustration kicked in.” From just looking at the aftermath of the wreck, he also knew that the car was totalled. Post-wreck, John was sent to the hospital and checked out due to precautionary reasons. “I didn’t know how bad the damage was until I was in the hospital and I was shown a couple of pictures…when I got home from the hospital I got a really good look, and unfortunately, the car was a total loss,” he says. A lot of drivers are very weary about bringing their race cars to different tracks due to the risks that come along with it, but John says, “We did know it was a risk, but accidents can happen any time you get onto the track. We were just in the wrong place at the wrong time.” Greg wasn’t worried about John bringing his race car to Wiscasset, saying that they were familiar with the track and reiterating the fact that John has won there before. “John’s a racer and I’ve wrecked a few in my day, so I wasn’t worried there. If anything, it makes him more determined. We had a really fast car in that race,”he says. After the frustration kicked in, Greg, John and the Peters family started looking at their options for the remainder of the 2017 season. John was worried that he wouldn’t be able to get back behind the wheel, saying that there were no plans whatsoever to jump back in a car for the rest of the season as of a few days after the wreck. “We took some time to regroup and get the car taken apart and brought to the dump, and then we got together as a family to determine the next step…we identified a move we wanted to make and I began reaching out to people to see if it was a possibility,” he says. From there, things came together rather quickly for the #51 team. In the days following the wreck, both Greg and John Peters got offers from a handful of different people, offering them rides to borrow, sending them leads on cars for sale, etc. But, the Peters family wanted a new car on a few conditions: they wanted to use their own motor, transmission, shocks and seat. They were able to purchase fellow driver Mike Landry’s old car, which was for sale. “He (Mike Landry) agreed to the deal, so we moved forward on purchasing the car. We were able to salvage some stuff from the old car, so our spare part inventory has increased,” Greg says. John says that he has always had an interest in purchasing Landry’s old car, but it wasn’t the right time. He says the wreck changed that, saying, “Once the funding came together, we picked up the car from Mike on Saturday the 5th, six days after Wiscasset. We really need to thank Mike for working with us on such short notice.” In terms of what they were able to salvage (besides what Greg listed) from the old car, John says that the front end wasn’t in bad shape, so they were able to salvage a few parts. Greg says that the team was lucky enough to get a car that was “basically” race ready, saying that he’s had to make some minor changes to the body to fit the transmission. He says that he’s spent a “countless” amount of hours since the wreck, working to get the car to their liking. John agrees with Greg, saying that they’ve both spent “several” hours in the shop since Wiscasset. “I’d say I have about 30 hours into it and my Dad has put in around 60. We did some body?? work, replaced a couple fenders, put our motor, transmission, seat, shocks, and miscellaneous equipment in. From there, we have finalized the setup and got everything mechanically working,” John says. Just over 3 weeks ago, John got into his wreck in Wiscasset and the team plans to make their return to Beech Ridge Motor Speedway on August 25th, this upcoming Saturday. Although John won “Best Appearing Car” this season with his red, white and blue ride, he plans on sticking to the plain black car featuring his main sponsors’ stickers for the remainder of the 2017 season. Although they’ve made a quick turnaround, Greg was never in a rush to get John back onto the track, always reminding people on social media that they were “taking time” with their comeback. “We know we took a dive in the point standings, so it was better to take our time rather than burn out,” he says. Now that the season’s coming to a close quickly, John is no longer focusing on points. He plans on finishing out the season at Beech Ridge and running the 2 remaining PASS races and the Granite State Pro Stock Series race at Star Speedway in Epping, New Hampshire. “We’d like to finish out strong with some competitive runs and hopefully make an improvement on how we were running before the crash. We’re really excited to now have a chassis that’s 10 years younger than our old one and is a straight rail car opposed to a perimeter. This is a proven, successful PASS car, so we’d like to keep that momentum going,” John says. Greg’s also excited about having a new car to work with, saying that the car is a proven fast car. Everyone in the family is “pumped” about getting back to the track, which is where they truly belong. “I never worry about John’s abilities on the track. He’s my son, but at the track, he is my driver. I have total trust in him,” Greg says. Just over 3 weeks ago, the John Peters Motorsports team was left in complete limbo about the remainder of the racing season. Thanks to a team of people and many hours of hard work, they’ve been able to make a quick recovery. “We first and foremost have to thank several of our friends and competitors who offered cars, chassis’, parts, assistance and support immediately after the crash. The support was so encouraging and it really helped us push forward,” John says. He also lends thanks to his father, mother, Troy Davis, Jim Savage, Patty Ryder, Nick Poland and his girlfriend Brooke Shaw for their constant help, encouragement and support. As always, he’s grateful for his handful of sponsors, which includes Runtal Radiators of North America, the Kulwicki Driver Development Program, AML Landscape & Property Service and a handful of others. “When things go bad in racing, the racing family cannot be beat. “Overwhelmed” would be a huge understatement. We were blown away with the amount of people that stepped forward to help our team. We will not forget them,” Greg adds. The preparation of a comeback hasn’t been easy for the John Peters Motorsports team, but they have worked hard (and worked together) to get it done in such a short period of time, a feat that not everyone can accomplish. It will be exciting seeing what the #51 can do for the remainder of the season!